Hailing from Canada but originally from Eritrea in East Africa, the sublime Grace Mahary lands firmly within the Top Ten Newcomers circle via a blazing Givenchy runway exclusive. Mahary began modelling in 2005 at age sixteen and was the winner of the Elle Canada Model Search competition. 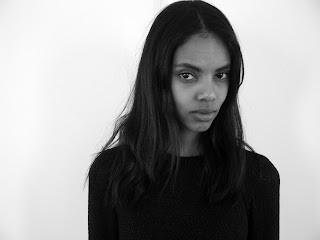 Swiftly signed by mother agency Elmer Olsen Management, Mahary is currently represented in New York by Ford Model Management. Blessed with an exquisite bone structure, wonderfully expressive eyes, voluptuous bee-stung lips, and an amazing 180 cm silhouette, Mahary has all of the physical attributes required to excel. Mahary's body of work up to date has consisted mostly of commercial editorial jobs for the likes of Wish magazine, Elle Canada and the South African edition of Cosmopolitan. All of that however is about to change following Mahary's riveting appearance at Givenchy. In an interview with Ford Model's Damien Neva, Mahary describes her initial meeting with Givenchy's Riccardo Tisci, "Nervous would be an understatement. I walked for him. He said he likes me and he said that I'm in the right place, at the right time, and I had to believe him when he said that." Following her Givenchy appearance, Mahary elaborates to Neva about the show's fallout. "So far it's been really good, I guess prior to that it was good in Paris but after that you just start to realise that a lot of people are watching you. A lot of people are asking questions now. I'm just thankful for whatever comes."